A very enjoyable and interesting account of scholarship's opinions of the meanings of Mayan inscriptions, architecture, and sculpture. It is fascinating that such an impressive civilization is gone and we would do well to take heed to the warnings that are implied in this book. Overpopulation, disregard of the limitations of the environment, and constant warfare eventually take their toll on any civilization. I recommend this book highly. It has no agenda. Just spells out what they believe about Mayan history. Imagine leaders with names like "Baby Jaguar" and "First Step Shark". Well-documented descriptions of the ruling dynasties of 11 Maya cities. Nice overview of Maya time periods, hieroglyphs, calendars, culture and politics. Published in 2000, the name spellings are from an older protocol; newer books use different spellings as epigraphic progress enabled better translations of Maya glyphs. Gorgeous color pictures throughout. 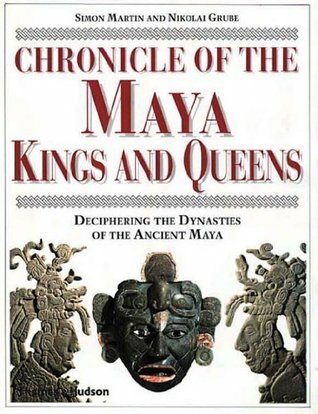 This work offers an up to date history of the Classic Period Maya based off of inscriptions and archaeological work since the publication of Schele and Freidel's A Forest of Kings. This book is noted for its detail in understanding the relationships between different polities such as Tikal and Teotihuacan or Calakmul's alliance used to defeat Tikal. It leans heavily on epigraphic analysis, without much analysis of why some of these texts may contain propagandistic lies. But it is overall great. Every known ruler from the major sites. Mayanists may benefit from seeking out the 2nd edition, as the bibliography is more complete. But the text itself has barely been revised. I very much enjoyed this book. I have been interested in Maya archaeology and history for many years. This was a very informative and up to date history of the Mayan kingdoms and their rulers. Very much recommended for anyone interested in this area. Gosto muito desta série de livros e este não me desiludiu. Permitiu-me conhecer melhor este povo tão impressionante. Excelentes imagens. This is an excellent resource for anyone wanting to research the history of ancient Mayan kings and queens, the Mayan language, calendar and culture. Mostly Yucatan Maya in the first edition-haven't looked at second edition-copiously illustrated and helpful to decode glyphs.